Earlier this week, I went to a tasting of wines from Turkey, India, Greece and Georgia at Laithwaites‘ HQ, Vinopolis. In a game of word association, say “Laithwaites” and I will generally think of ripe, fruity, unchallenging wines that are usually overpriced and oversold – I wrote as much in a post last year On Laithwaites, and the Laithwaites wines I’d had since have done little if anything to change my thinking. So I decided to head along to this tasting with slightly mixed feelings – it was after work and just round the corner, so easy to get to, would score me a few Fringe Wine points for obscure countries and grape varieties and finally it was a chance either to reconfirm my feelings about Laithwaites or be pleasantly surprised. And besides, it’s not every wine retailer CEO that adds a comment to one’s blog and I was keen to meet the man to see if the reality lived up to the persona. In person, Tony Laithwaite is more restrained than a reading of his tasting notes would suggest – he’s not all exclamation marks and exuberance, but rather told a few, stock-but-amusing anecdotes about his early days and generally has the gravitas one would expect of a company CEO with a headcount of over 1,000 keen to point out that Laithwaites is still a private company with no outside shareholders. 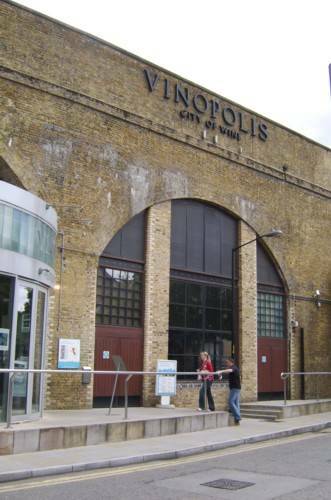 The tasting fell into three parts, with the first being the tasting of the new wines – to be offered from April onwards – presented by buyer Cat Lomax. Of all the countries represented at this tasting, India is perhaps the most interesting precisely because it has almost no modern wine history whatsoever; viticulture was originally introduced to India by the ancient Persians, but India’s wine-making traditions all but died out in the 20th century due to a combination of the after-effects of phylloxera, independence and changes in religious and public opinion. Mostly tropical, India is not a natural wine-making country; however, as in Greece, the effects of altitude can provide viticultural potential and the grapes for this wine are grown on a plateau just outside Mumbai. Pale gold in the glass, on the nose this wine shows green capsicum, mixed spice (a suggestive hint of Indian cornershop, perhaps ?) and touch of green chilli bitterness. On the palate, there is rounded, mouthfilling acidity and a minerally finish. Overall, surprisingly well-made and balanced – if a little atypical. In the news for all the wrong reasons at the moment, Greece is perhaps the most mainstream of all the countries represented at this tasting. A blend of 60% Assyrtiko and 40% Sauvignon, the grapes are grown at altitude in northern Greece cooled by sea breezes. Pale in the glass, it has a more typically aromatic and herbaceous Sauvignon nose, with stone fruit, crisp rounded acidity and good minerality, especially on the finish. A good and well-made wine, but not one I’d pay almost £12 for – to say that Greek wines are not generally cheap is to acknowledge that the country offers poor value-for-money and perhaps they would be better not competing at this level, but like Austria, to focus on the higher end of the market where lack of economies of scale is not an issue. Either that or wait a year or so and Greece may well find itself outside the Euro and with a Drachma currency again that it is able to devalue by 50% to stimulate exports, at which point this wine could sell more easily for the £6 – £8 price that it is worth. The main grape in this wine is the native Turkish Kalecik Karasi, with some Syrah in the blend; the wine shows elderberry and plum fruit, with dark spice, pencil shavings and and inky texture and good tannins. Tasted blind, this could be a Rhône Syrah – it is the classiest and most interesting wine here and also represents good value at the price. I am not surprised to learn it has various (if unspecified) Gold Medals. I have had Saperavi on a few occasions before when I have been in Ukraine and recall it as fruity and grippy, but generally lacking in mouthfeel. From the sub-tropical former Soviet Republic of Georgia, this example of the country’s flagship grape shows cassis, vanilla, spice and liquorice on the nose. On the palate it is smooth and rounded, a ripe crowd-pleaser, finishing grippy and spicy. Overall, despite a promising start, the palate and finish somehow don’t quite live up to expectations. All the wines here were surprisingly well-made, interesting / unusual and certainly above average for Laithwaites. Not all were great or particularly good value, but I would certainly consider buying the Vinart Kalecik Karasi Syrah 2010. Tagged laithwaites, vinopolis, wine. Bookmark the permalink.